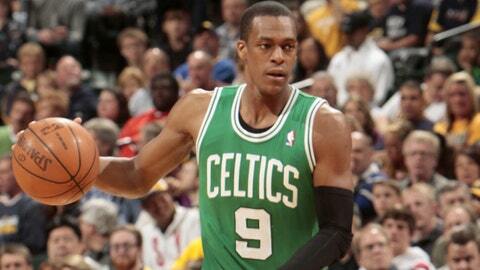 Before Rajon Rondo steps on the parquet floor at TD Garden, he might first see some time on a D-League court. While the Boston Celtics point guard continues to recover from his torn ACL, head coach Brad Stevens says the next step in Rondo’s rehab could be to play with the team’s D-League affiliate, the Maine Red Claws. On Monday, Stevens told Gary Washburn of the Boston Globe that the organization has discussed the move to get Rondo some game experience as he nears his return to the Celtics. "I would make that a decision on him and our staff," Stevens said after practice. "That is something that has been discussed, probably some positives and negatives to that, but at the end of the day, it is an option as part of his rehabilitation." It would be something of an unorthodox move in the NBA, but it is a move the Celtics have made before. Avery Bradley rehabbed with the Red Claws during his rookie season. "I think the D-League will be used for rehabbing more than it has been, over the next four or five years," Stevens said. "And it makes a lot of sense. It’s like all the time you see major-league [baseball] players play in Triple-A. … But that would be a question for [Rondo]. We have talked about it in our offices. It’s a possibility for sure."